Although, there are many different carrot varieties available, British farmers tend to grow the Nairobi variety, a berlicum-antes cross, which is reliable, damage resistant and produces a good yield. You can buy Nairobi carrots in many guises from baby carrots to tender new season bunched carrots, and as your essential everyday loose carrot. Nowadays, you can buy pre-prepared carrots to meet your every whim too, such as batonned, grated, sliced, diced,mashed, tinned and frozen. Organic carrots are also widely available in the supermarkets and shops. Chantenay carrots, however, are a different variety to the Narobi carrots. They are sweeter with a chunkier top to them. Chantenay were the main variety grown during World War II, so if you see wartime pictures of the Ministry of Food’s cartoon character Dr Carrot and notice he looks a bit triangular, then that is why. Watch out for sweet, tender and aromatic new season carrots in the summer time – they are in season between June and August. There is so much flavour packed into their skins, they simply need steaming or boiling gently for between three and five minutes (depending on how crunchy you like them). Their delicate flavour can be complemented with a little butter and orange zest, or tarragon and thyme. They’re also delicious simply eaten raw. In the autumn, British carrot farmers start putting their crop “to bed” for the winter months by covering them with a thick layer of straw to protect them from the frost. This eco-friendly method of storage, takes place across large swathes of land in Nottinghamshire, Yorkshire, Lincolnshire, Norfolk, Suffolk and Scotland. The earth becomes nature’s larder, keeping the crop fresh and ready for harvest throughout the winter, allowing farmers to provide the UK with an almost year round supply of carrots. Before farmers adopted this practice in the 1990s, carrots were predominantly a summer vegetable. Older carrots have a more pronounced flavour, and the winter crop has a stronger flavour still, making them perfect to hold their own in stews and soups. 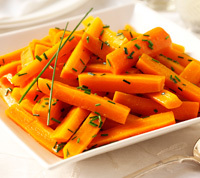 Unlike most other vegetables, carrots are more nutritious when eaten cooked. Cooking helps to break down the tough membranes of the plant which makes it easier for our bodies to absorb some of the nutrients they contain, including beta-carotene.